Online mood charts help predict mood swing cycles for bipolar mood disorders, depression, anxiety, pms and other mood swing disorders. It also provides medical charting for tracking cycles of 100+ physical conditions and illnesses. Highly interactive charting system. Depression mood charts provide a type of online mood diary so you can better calculate your next mood swing. Track your mood, medicines, menstrual cycle, anxiety level, irritability level, stress level, headaches, hours slept and more. Mood charts are a wonderful way to track your moods, side effects, sleep patterns, and more. These online interactive charting systems enable you to chart your health for your own self-help purposes. It's a daily log written by you. The mood charts help you to create a record of daily events that affect you emotionally. This includes the medication you took, side effects from medications, and what type of mood or moods you experience during the course of the day. 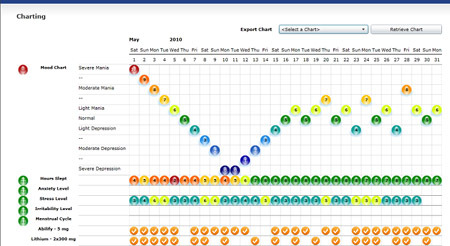 Mood Charting is a great way to keep a going history of bipolar depression disorder and to track symptoms that you maybe experiencing. This running health history of your health gives you a great window of opportunity to know what is going on with your health and a clearer way to pin-point health issues, including menopause mood swings and pms mood swings. Mood-Chart is the most sophisticated online mood tracking service you will find! When you sign up, you gain registration access to your online Mood-Chart where you can customize your charting and track your cycles based on your requirments. Mood-Chart allows you to track over 100 symptoms. You can output every chart to PDF. You can track medicines, add notes to charts and give access to your charts to professionals. Your Mood Chart is developed by Monitor My Health, LLC. Monitor My Health, LLC focuses on medical software with is enabling people to chart their health for self-help purposes. $15 will provide you ONE MONTH’s access to the online Mood-Chart interface. After you pay, you will receive instructions on how to register on Mood-Chart and you will receive the access code to enter into the site once logged in. Immediate access to the Mood-Chart is available once payment is approved. Click HERE to gain immediate access to the Online Mood-Chart. Please see our links to other great sites about depression.